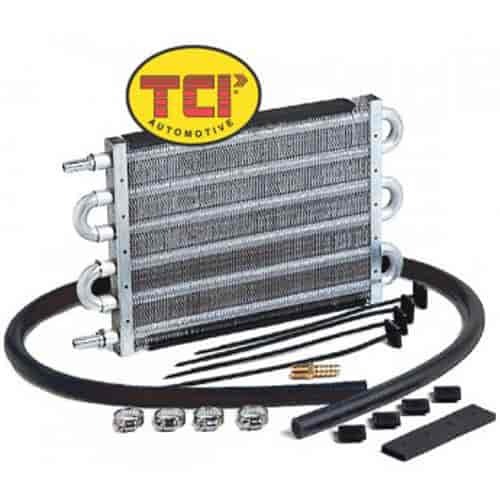 TCI Racing Transmission Cooler 7-1/2" x 15-1/2" x 3/4"
7-1/2" x 15-1/2" x 3/4"
TCI has designed this High Performance Transmission Cooler for use in racing applications, but itcan also be used in street and towing applications. This TCI cooler is constructed with a tube and fin design from lightweight aluminum with a black powdercoat finish for durability. Cooler comes complete with #6AN fittings to connect to steel braided or high pressure lines. TCI transmission coolers are designed to keep your transmission fluid cool and provide you with years of trouble-free service. These durable, yet lightweight, precision machined transmission coolers are made from quality materials and offered in a variety of styles to meet your needs.